Help your child with their addition work, from the basics in Reception to calculations in KS1 and KS2, with some teachers' tricks to help the learning stick. It’s vital that younger children understand what addition really means before they learn how to complete abstract calculations. The key is to point out addition as it naturally occurs in everyday situations, so let them hear you add while thinking aloud (for example: “I have one apple for James and one for Lucy; I'll need two more for Emily and Ben, so that's four apples altogether.”). Make up ‘real’ situations for them to use addition in, too. Play shops at home (and help them add amounts), or schools (where they have to add up how many children, for example, are having dinners). When they do bring home written calculations to do, get out some resource objects such as Lego brick or beads to help them picture the numbers in tangible form. This really helps motivation (as they get the point of it!) as well as a deeper level of understanding. Many schools use puppets for whole-class maths work in Key Stage 1 (ones with movable mouths can be highly effective at engaging children). At home, use puppets or your child's soft toys to get calculations wrong, then ask your child to help explain to the puppet why it was wrong and help them to get it right. Asking your child to take a turn at teaching is a thorough and effective way to learn! Story problems (or word problems) are often used in primary maths as they add a ‘real-life’ element to numbers work, though teachers can be guilty though of assigning children endless problems without offering them a chance to write their own. Turning the activity on its head and letting them write the stories can help them think carefully about what constitutes an addition. When writing an addition story problem they will need to remember that at least two amounts are needed, as well as a reason for them to be added. Once they’ve written a story to go with their calculation they can find their answer. You could help them with this by giving them a picture or a group of objects. For example: draw a picture of two fields and put six cows in one and three cows in another. Encourage your child to write a problem to go with this picture. Alternatively, you could put five of their cuddly toys on the bed and two toys on the floor. Ask them to write a story problem to go with this scenario. From Reception on children are taught to use number lines and number squares. This is not ‘cheating’, but a great way to help children visualise numbers and number patterns. Teachers will often give children a number line to help them with addition. If they are adding 6 and 4, for example, they will be shown how to put their finger on the 6 and then count on 4 from there. 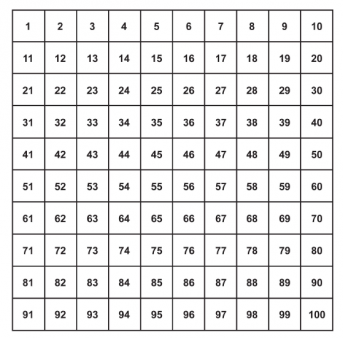 Working with a number square (or 100 square) is all about learning tricks such as moving down a line to add on 10 instead of counting along – all of this can be hugely time-saving as well as helping them to understand how numbers work. It is a good way to show children then when you add ten to a number, the tens number changes but the unit stays the same. Good maths learning is fun, and at school many KS1 maths objectives are taught via games. Make the most of an otherwise boring time, daily driving, by playing games such as adding the number plate numbers of other cars or adding the number of motorbikes and bicycles you can see. Adding a timed element to calculations can be great for competitive types! When you want to focus on mental maths strategies, playing games such as Bingo can help maths become much more engaging. Work out a list of calculations and write the answers in a bingo board format; they'll need to circle the right answer when the calculation is read out. They’ll probably be accustomed to doing such activities as part of whole-class work at school. As children get older and are adding more than two numbers together, using numbers that are increasingly higher, using this kind of logic will prove really helpful. They might use their knowledge of doubling small numbers to double large numbers (for example, when they are asked to double 40, they may remember that double 4 is 8, so double 40 must be 80). In Key Stage 2, children start to add larger numbers (three digits in Year 3, four digits in Year 4 and even larger numbers in Years 5 and 6). Column addition is the best method for working out addition of larger numbers, however it can be helpful to start off with partitioning in Year 3, so that children are aware of how to add multiples of 10 and 100.